63 posts categorized "Dirty Tricks"
Rabbi Yoshiyahu Pinto's spokesmen are blaming Pinto's estranged fundraising assistant and 5WPR head Ronn Torossian for the disappearance of milllions of dollars of Pinto's charity's money, and Torossian's company is reportedly responsible for sockpuppeting false information about Pinto on Wikipedia. In 2008, 5WPR sockpuppeting for Agriprocessors and Sholom Rubashkin was exposed by FailedMessiah.com in a story that made headlines. Did Berel Lazar Orchestrate the Ouster of Chabad Yeshiva Students Aligned with a Rival Chabad Organization? …Just a week before the arrests, one of the yeshiva’s leaders in Israel wrote a letter to [Chabad's "chief rabbi" of Russia, Berel] Lazar, accusing him of working to hurt the yeshiva. “If it will become public that the chief rabbi of Russia allowed one of the best yeshivas in Russia to be closed — and on the eve of the birthday of the founder of the yeshiva — we can just imagine what other people will think,” wrote Mordechai Ashkenazi, chief rabbi of Israel’s main Chabad enclave. Is Berel Lazar behind the expulsion? I'm still not convinced, in part because some of the tactics Lazar says Ashkenazi and Aranow used have been used by both men previously in other, non-Russia disputes including one I'm aware of from about 15 years ago. But time will tell. Berel Lazar's response to Rabbi Ashkenazi's accusation is posted below. If you have the time and ability to translate, please do so and send it to me in the body of an email (no attachments, please) and I'll post it. 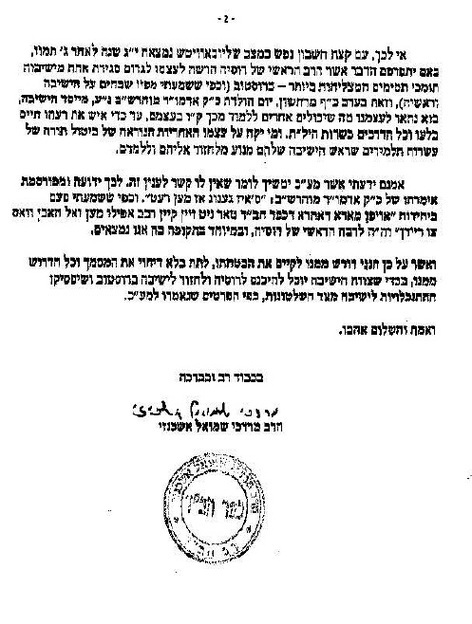 UPDATE 9:10 PM 11-7-07: A translation of Rabbi Lazar's letter also follows below. Chief Rabbi of Kfar Chabad Accuses Chabad's "Chief Rabbi of Russia" Berel Lazar – Did Lazar orchestrate the expulsion of Chabad yeshiva students from Russia and the closure of their yeshiva? Rabbi Ashkenazi is reacting to this. I'll try to post Rabbi Lazar's response tonight, along with a translation. Meanwhile, a translation of this letter is posted here. Chief Rabbi Amar Bullies RCA Into Submission On Conversions? Sephardic Chief Rabbi Shlomo Amar is visiting the U.S. this week in order to approve the appointment of religious court judges (dayanim) to the conversion courts of the Rabbinical Council of America (RCA). The agreement reached between the RCA and Amar gives the Israeli Chief Rabbinate practical control over the conversion process in U.S. It will also create new problems for those wishing to convert to Judaism there, similar to the kind that exists today in Israel. For years, the religious councils in Israel accepted conversions performed by rabbis of the RCA, the largest body of Orthodox rabbis in North America. But in recent years, marriage registrars in local religious councils here have refused to recognize conversions by the RCA, and refused to allow those converted to marry in Israel. This new policy was dictated by Amar, who also provided the councils with a limited list of American rabbis who were the only ones authorized to conduct acceptable conversions. Amar is actually considered to be more lenient in conversion matters in Israel, but he is under strong pressure from ultra-Orthodox rabbis who want to severly restrict the number of conversions, and who are demanding that all converts keep a strict Orthodox lifestyle. The ultra-Orthodox rabbis object to the RCA in the U.S., which is identified more with the Modern Orthodox community, and have even set up a rival organization, Netzah Mishpahat Yisrael, to provide stricter conversions. The new group is trying to achieve full control of the conversion process in both the U.S. and Israel. As a result, Amar gave the RCA a list of demands in order for their conversions to be recognized in Israel. Among other things, Amar demanded to end the common method of conversion in the U.S. whereby local rabbis were allowed to do conversions in their cities. Instead, Amar is demanding that only special conversion courts undertake conversions, and that he approve the members of these courts. These demands were a source of controversy within the RCA, and a number of members even threatened to secede from the council and set up a separate organization. However, in the end they gave in and agreed to Amar's demands, since a lack of recognition of RCA conversions by the Israeli Chief Rabbinate would seriously harm the RCA's standing and cause potential converts to go elsewhere. The new conversion courts will potentially force converts in the U.S. to travel long distances in order to be converted by an approved conversion court, which will demand that candidates keep a strict Orthodox way of life, without knowing them or their personal history. "The rabbi went to meet the religious judges and check the courts," Amar's office said. "They were not promised anything, and they did not promise us anything. In the meantime, the Rabbinate is continuing to recognize conversions by the rabbis it recognized in the past." Rabbi Basil Herring, the executive vice president of the RCA, said in response: "We are pleased to host Rabbi Amar on his visit to New York and Chicago. We are discussing a number of important matters with him, including the issue of conversion." …[T]he Monsey-based haredi group, Eternal Jewish Family. EJF, founded and run by Rabbi Leib Tropper, is a major player in the haredi move to control the conversion process worldwide. Rabbi Tropper, who is also the founder and rosh yeshiva of Kol Yakov, a Monsey-based haredi ba'al teshuva yeshiva, is a controversial figure. Rabbi Tropper has been accused of using bait-and-switch tactics to lure potential converts from intermarried families. In one southern city, Rabbi Tropper promised potential converts that a mikva would be built and a shul opened – no one would need to move to Monsey or another Orthodox enclave. But, when the time for conversion neared, no mikva existed and no synagogue functioned. The promised rabbi Tropper was to send had not arrived. Then, Rabbi Tropper dropped a bombshell. These potential converts, all serious, all had studied for more than a year, would have to move from the southern United States to Monsey, New York – or their conversions were off. Rabbi Tropper told me these converts confused his hopes with promises. But in email correspondence shared with me, Rabbi Tropper admits in part to misleading these poor people. The husband of this family is in his 50s. He has years vested at his job with a pension due on retirement. He will lose all that if he moves, along with facing the problem of finding a new job at that age. Rabbi Tropper made many cloud-like promises – this friend in Monsey will find something for you or that man who works for the city will take care of you – but nothing concrete, and the family was unwilling to trust a man who had already lied to them. Rabbi Tropper summarily threw the eldest son of this family out of his yeshiva, leaving him broke with no way to get to the airport and back home. He claimed the boy was not serious about his learning yet the boy's teachers had given the family nothing but praise – until the day they refused to move to Monsey. This teenager had to borrow money to get home. Tropper had promised the family the boy would be able to get his GED at Kol Yakov, and he urged them to withdraw the child from public school and send him to Monsey and Tropper's yeshiva. But Tropper made no arrangements for that GED. It did not matter, however, because the boy was ineligible for a GED under NY law because he was too young. He lost a year, and had to regroup and restructure his life, all because Rabbi Leib Tropper cannot tell the truth. These people spent thousands of dollars on new kitchen appliances and dishes, kept strictly kosher and did whatever Rabbi Tropper demanded. They appeared on Tropper's EJF website praising the organization and were used by Tropper as examples of his "successful" approach. This material was apparently shown to Rabbi Shlomo Amar, Israel's Sefardic chief rabbi, and to other Israeli haredi leaders who later moved to block acceptance of all Rabbinical Council of America (Modern Orthodox) conversions. Now this family is "lost" to "Yiddishkeit" because of Tropper's failings. And, sadly, that is still true. The only place Rabbi Tropper's bait-and-switch tactics have been reported is here on FailedMessiah.com. But that, I hope, will soon change. In the meantime, we can watch the RCA give in to haredi demands. …Why is this happening? Because the leaders of the RCA and YU showed weakness. Rabbis Hershal Schachter and Mordechai Willig have been silent in the face of haredi attacks against Modern Orthodoxy, as has the RCA's weak executive director, Rabbi Basil Herring. It may be too late to stop the tremendous amount of pain Rabbi Amar's theocracy will cause women and converts, but it is not too late to remove the MO leaders who did not stand up when it counted. Bottom line: Rabbis Schachter, Willig and Herring still have their jobs on July 1, you'll know the RCA has sold out MO. You'll also know which rabbis and institutions should not receive your donations. Don't give another penny until these leaders stand up or are fired. Previous posts on the RCA-Rabbinut Conversion 'Agreement': 1, 2 & 3. Russia's strongman Vladimir Putin came to power with the backing of Chabad-linked oligarchs opposed to the oligarchs that backed the Russian Jewish Congress. Shorty after Putin's election, Putin recognized Chabad rabbi Berel Lazar as "chief rabbi' and ostracized the rabbis and leaders linked to the Russian Jewish Congress. On the day he recognized Lazar as "chief rabbi," Putin's police arrested the RJC's leading oligarch, Vladimir Gusinsky. Putin harassed, arrested or exiled pro-democracy oligarchs. He curtailed press freedoms and squashed democracy. He persecuted religious minorities. And all the while, Chabad's Berel Lazar stood by Putin's side, praising Putin. Lazar led a campaign to de-link US-Russia trade status from Human Rights. He gave Putin a medal while standing on the bone and ash of Auschwitz. He began the process of whitewashing the Soviet Union's murder of Raul Wallenberg. Lazar did not succeed in changing Putin's thuggish image, either in the US Congress or in American public opinion. Now it seems Vladimir Putin has a theory about why Lazar has failed, and Putin is acting on it. Putin now believes only a rabbi that represents all the varied Jewish communities of Russia can do the job. Lazar, despite his claims to be representative of all Judaism in Russia, is clearly a nothing more than Chabad's political leader. That is how Lazar is viewed in the West, and it is how Lazar is viewed in Israel, as well. So, yesterday Putin invited the once exiled Chief Rabbi of Moscow Pinchas Goldschmidt to a private meeting in the Kremlin, the first time a non-Chabad, non-Lazar rabbi has been so honored. The sudden turn of events in Moscow may also have an effect on Israeli politics. In contrast to Lazar, Goldschmidt is a Lithuanian ultra-Orthodox rabbi and is very close to Rabbi Elyashiv, a powerful political figure in Jerusalem. Goldschmidt's improved standing in Russia could help [Russian-Israeli oligarch Arkady] Gaydamak in his plans to run for mayor of Jerusalem. Ha'aretz notes that Gaydamak is the patron of the RJC and has been in a feud with fellow oligarch, Chabad's Lev Leviev. The move by Putin is seen as a snub to Leviev as well as a rejection of Lazar. The JTA's take on all this is here. In a move that threatens to split the Chief Rabbinate, a group of religious Zionist rabbis rebelled against the state's supreme rabbinic authority and announced Tuesday that they would set up an alternative kosher supervision apparatus during the shmita (sabbatical) year. "If local rabbis refuse to recognize fruits and vegetables grown [using heter mechira] by Jewish farmers during the shmita year as kosher, then we will," said Rabbi Rafi Freuerstein, chairman of the Tzohar organization. "We believe it is important to strengthen Jewish farmers and Jewish agriculture and provide reasonably-priced produce to the Jewish nation," he said. "The Chief Rabbinate is not fulfilling its function as a rabbinic authority for the entire Jewish nation," said Rabbi David Stav, a member of Tzohar, during a press conference Tuesday. "Rather, it has been taken over by Rabbi Yosef Shalom Elyashiv and Lithuanian haredi interests. We are trying to save the Chief Rabbinate from itself." "If the rabbinate is dismantled as a result of internal fighting, we risk losing national recognition for rabbinic authority," said Rabbi Ratzon Arussi, chief rabbi of Kiryat Ono and a member of the Chief Rabbinate's governing council. Rabbi Moshe Rauchverger, another council member, said that Tzohar threatened to break the rabbinate's monopoly over religious services and open it up to Reform and Conservative streams of Judaism. "If Tzohar starts providing kosher supervision, what is to stop Reform and Conservative from doing the same?" said Rauchverger. However, Tzohar might run into legal difficulties. According to the law, the Chief Rabbinate is the only body authorized to provide kosher supervision in Israel. Private kosher supervision firms can provide their services only after the rabbinate has already provided supervision. In an attempt to get around this legal obstacle, Tzohar intends to refrain from calling its service kosher supervision. The group said that several business have already requested a Tzohar kosher certificate, including a large wholesaler. Meanwhile, the Supreme Court has tried to get the Chief Rabbinate to act responsibly and legally, but to no avail. In a response to a petition from Israeli farmers, the court asked the Chief Rabbis to certify businesses that sell heter mechira produce. The Chief Rabbinate refused. Attorney-General Menachem Mazuz, who believes the Chief Rabbinate is violating the law, also recently pointed out that the Chief Rabbinate itself has recognized heter mechira as a legitimate solution to shmita restrictions by appointing Rabbi Ze'ev Weitman to supervise heter mechira under the rabbinate's auspices. The Jerusalem Post notes the Supreme Court is expected to reach a decision regarding this in the next few weeks. Farmers are concerned that a haredi power struggle to monopolize the fruit and vegetable market in the upcoming shmita [Sabbatical] year could cause growers as much as a NIS 700 million loss and result in a sharp rise in retail produce prices. Yusta Bleier, Chairman of the Farmers Association, said Wednesday that fruit and vegetable growers were "very concerned" about "aggressive marketing tactics" being pursued by certain haredi kosher supervision organizations. But haredi rabbinic leadership has traditionally opposed heiter mechira since it was first introduced at the end of the 19th century. The haredi rabbis scoff at the attempt to stage a fake "sale" of the land so as to permit farmers to continue to work as usual during the shmita year. Instead, haredi rabbis demand that all fruits and vegetables be bought from non-Jewish, mostly Arab, farmers inside Israel who have legally registered ownership of their land or from farmers outside Israel. Haredi leaders are also trying to put pressure on the Agriculture Ministry to increase produce imports, which would be a serious blow to local farmers. In previous shmita years, said Bleier, haredi rabbis were concerned solely with providing kosher supervision over fruits and vegetables earmarked for their own followers. "But this shmita year the haredim have become much more aggressive. They are now waging a war against heiter mechira. They are doing everything they can to block the sale of heiter mechira produce. "But we won't let them. If we need to we'll set up our own fruit and vegetable stands outside the supermarket chains and sell our own produce." In several cities local rabbis have announced that they will refuse to allow heiter mechira produce to be sold in their cities. Grocery stores will have to choose between no kosher supervision whatsoever and the stringent, haredi supervision. For instance, the rabbis of Rehovot, Petah Tikva and Herzliya have already announced they will not allow the sale of heiter mechira. Wholesalers in Herzliya have petitioned the Supreme Court to force the local rabbi to allow the sale of heiter mechira. The wholesalers argue that since the majority of Herzliya's residents are not haredi the local rabbi cannot coerce them to accept a stringent haredi kosher supervision. In Bat Yam, Ra'anana, Afula, Kfar Saba and Ashdod the chief rabbis are also opposed to the sale of heiter mechira. In Jerusalem, where there is no chief rabbi, the situation is similar. Only the more stringent kosher operations will be allowed to give supervision. Bleier said that annual agricultural production in Israel was NIS 7 billion. While last shmita, the haredi market only accounted for about 6-7% of the market for agricultural goods, the demand has grown so that today they represent about 17% of the market, translating into a loss for farmers of about NIS 700m. However, the head of shmita year kosher supervision for the Edah Haredit denied his organization, which is the single largest kosher supervision apparatus catering to the haredi population, has any interest in monopolizing non haredi markets. "We are focusing solely on predominantly haredi areas such as the haredi neighborhoods in Ashdod, Beit Shemesh, Modi'in Ilit, Beiter Ilit and Safed." The Edah Haredit source admitted, though, that his competitor, Efrati's Kashrut Le'mehadrin [please see below], was pursuing an aggressive campaign to expand his organization's influence beyond the haredi sphere. First, any locality's chief rabbi that refuses to allow heter mehira produce to be sold should be dismissed. The state has no business paying these rabbis' salaries. Second, it would be wise if a movement could be started to boycott all haredi-endorsed produce and food. What they try to do to us should be done to them, but legally and in spades. I believe "Efrati's Kashrut Le'mehadrin" is run by Rabbi Efrati, haredi leader Rabbi Yosef Shalom Elyashiv's right-hand man. Rabbi Metzger threatened to sue the Rabbinate in civil court and the panel backed down, accepting Rabbi Metzger's promise not to run for chief rabbi of Tel Aviv. Later, Metger declared his candidacy for Ashkenazi chief rabbi of Israel and received the backing of Rabbi Elyashiv. Haredi spokesman Rabbi Jonathan Rosenblum told me then that Rabbi Elyashiv was "fully aware" of Rabbi Metzger's ethical and legal problems including the judgment against Rabbi Metzger by the Rabbinate's panel of judges and the allegations of sexual harassment, but said that Rabbi Elyshiv chose to back Rabbi Metzger anyway to "return the glory" to the chief rabbinate. Of course, what Rabbi Elyashiv really wanted was the weakest candidate that he could propel into office. That would weaken the Rabbinate and, at the same time, put it under Rabbi Elyashiv's control. So haredim under the leadership of Rabbi Elyashiv are inflicting their stringencies non-haredim. At the same time, their actions may very well bankrupt Israel's farmers. Rabbi Elyashiv does this in the name of Torah but, make no mistake about it – it is political power and the money that comes with it Rabbi Elyashiv seeks. Many religious leaders are misguided. Some, as you know, are criminals who parade in the clothing of saints. But I think few religious leaders are truly evil. However, Rabbi Elyashiv is, in my eyes, one of those truly evil men. …Haredi residents had hung up a sign at a shopping mall attesting to the character of the place, instructing shoppers to dress modestly. The shopping center has little traffic as it is, having to adhere to strict modesty regulations and holding limited supplies. The local health clinic and supermarket operate separate hours for men and women. A pizza parlor owner was warned that if boys and girls sat there together in the evenings, they would suffer the consequences. After the plaque was removed by police and local inspectors, on the grounds that it was placed there illegally, all hell broke lose. Haredi residents started throwing stones at the police, who responded by fighting back. Eight protestors were arrested and one was evacuated, unconscious, to hospital. When Ramat Beit Shemesh B was built, most of the residents arrived from the overflowing extreme haredi communities in Jerusalem: Neturei Karta, Toldot Aharon and Satmar. Out of a total 5,000 haredi families in Beit Shemesh, 1,500 families are from these sects. The national religious population has been driven out of town. "I am planning to leave with my family very soon," said one national religious woman. "Every time I walk down the street, I'm frightened. Hundreds of haredim stare at me and scrutinize the way I'm dressed. It is not pleasant to live here." [Edah Charedis spokesman Rabbi Shmuel Haim] Popenheim responded: "The secular people must understand, they either lock up [the pizza shops and falafel stands] early or they'll have trouble." …The plan is that once a restitution law is passed, neither the properties nor the cash will be apportioned. Jewish religious, cultural, educational and welfare organizations will have to apply to a foundation, proposing projects and making their case for support. Krinsky will have to compete with the others. "I've said repeatedly that I think Chabad would merit support, just as other institutions would," said Rabbi Andrew Baker of the American Jewish Committee, who leads the international team negotiating restitution with the Lithuanian government. "However, I don't think that's what Rabbi Krinsky is speaking of. He believes he's the only bona fide religious Jewish organization in Lithuania." Krinsky has tried to circumvent the process. Several months ago he approached the Lithuanian Ministry of Health requesting the return of a former communal property. But he was rebuffed. As a U.S. citizen, he approached the U.S. Embassy in Vilnius for help in obtaining a state-owned music academy in the desirable Old Town. According to the U.S. official familiar with the situation, the embassy sent a letter to the government supporting Krinsky, but also asked Krinsky and local leaders to bury the hatchet. "We've seen a lot of quotes in the press where some people from the government or on its periphery have said the Jewish community can't even agree on restitution, so how can we make an agreement," the official said. "We've told them we don't want that as an excuse to not go forward." In April, Krinsky met with local Jewish leaders. Afterward they sent him a letter outlining conditions for breaking the stalemate. Among them: Krinsky must publicly acknowledge the community's ownership of the synagogue and its choice of chief rabbi; cease referring to himself as "chief rabbi"; and submit to "a sound, open and transparent financial management." For its part, the Baltic Times had a story in September 2004 about the fighting between Chabad and the Lithuanian community. Its report seems to confirm much of what the community said. Chabad has been in Vilna for ten years. During those ten years it has held public events and adult education classes. Check and see how many of these events commemorated the life or yartzeits of the Vilna Gaon, R. Chaim Volozhoner, R. Chaim Ozer, and other non-Hasidic leaders of Vilna's past. Then check and see how many of these events commemorated the life or yartzeits of Chabad rebbes. If the two are not equal, if the commemoration of Chabad-related figures and events far outnumbers the others -- and this clearly appears to be the case -- then you can understand what the Vilna Community is worried about. Chabad has a sordid history of this type of bad behavior, but it also has done much good. The Vilna Jewish Community did not seek to evict Chabad from the city or to curtail Chabad's educational efforts. But the Community is trying to stop Chabad from running roughshod over the long-established traditions of Vilna and from taking over community property and institutions that do not now and never did belong to Chabad. In this effort, the Jewish Community of Vilna deserves our support. Rabbi Sholom Ber Krinsky does not seem to be the type of person Vilna needs. It seems Chabad has finally recognized this. Will Rabbi Krinsky be withdrawn from shlichut? I doubt it. But I'm sure there are communities in Asia or in America with no established Jewish community but a need for a mikva, a shul, classes and outreach. Perhaps one day Rabbi Krinsky will use his talents in one of these. And these strong arm tactics aren't restricted to non-Orthodox either. Last week, the non-Chabad but scrupulously Orthodox Conference of European Rabbis had its regular standing committee meeting, planned six months in advance, in Odessa in Ukraine. A week before the event, suddenly Chabad organised another event in the same city entitled Conference of Ukrainian and European Rabbis. The only ones there of course were Chabad shlichim but the event was hastily arrnaged because Chabad cannot let it be seen that there is anything else in ukraine and russia than Chabad. Meanwhile, they phoned up members of the community and tried to bribe them to work for Chabad and they said they were opening a Jewish university in the town when there is already one there. They really hate Odessa because the city's Orthodox community runs an amazing network of schools, shul, orphanages, yeshiva, kollel and community which is frum and successful. Just remember the words of lev leviav to a non-Chabad European rabbi. "Russia and Ukraine belongs to Chabad. Get your people out of there." These people are thugs. Orthodox or not. Solomon schecter schools have no less Jews in them than Ohr Avner ones. And Chabad calling up the Governor of Odessa to beg him not to meet a delegation of Europe's most senior chief rabbis half an hour before he met must take the biscuit for chillul hashem. Shmarya, keep exposing them. It's not just their theology which isn't Jewish, it's their ethics or lack thereof. The JTA reports Chabad and its Ohr Avner network of schools, funded by Israeli billionaire Lev Leviev, tried to take the Conservative Movement's day school in Ukraine. The Schechter Institute claims the local Chabad rabbi, functioning as a representative of both Chabad and Ohr Avner, offered "Chernovtsy municipal authorities $160,000 per year for the school." The JTA notes that amount is "several times the school's present $35,000 annual budget, most of which is provided by the municipality." At the heart of the issue appears to be the number of halakhicly Jewish students at the Schechter school. The JTA reports 2/3 are considered Jews under the Law of Return, which means they have at least one Jewish grandparent. Rabbi David Mondshine, the Moscow-based head of Ohr Avner, told the JTA Ohr Avner schools will not accept students who are not halakhicly Jewish. The Chernovtsy school operates as a secular public school with Jewish ethnic and cultural components. It teaches Hebrew, Jewish history and culture, as well as Jewish traditions and literature. The Jewish curriculum is prepared by Midreshet Yerushalayim in Jerusalem. In effect, Chabad's offer would have removed all of the non-halakhicly-Jewish students from the school, and left Chabad with the building and perhaps half of the student body. The budget proposed by Chabad is far more than the school needs to operate. Presumably, the surplus would go into the city's coffers or into the pockets of city officials. For its part, Ohr Avner denies the attempt to takeover the Schechter school, claiming that they wanted to start a different school. But there is no need to petition the city to do that, and to offer to pay the city far more than what is needed, to open a different school. Chabad could open a private school, as indeed they usually do. It seems then that Chabad saw an opportunity to gain control of an expensive state asset, the school building, and kill the non-Orthodox school at the same time. Is this ethical? Does the fact that the Conservative school is "pluralistic" and does not follow Orthodox halakha justification for this attempted takeover? For bribing city officials? What do you think? A community builds a mikva, intended for monthly use by women and for conversions from all Jewish streams including Reconstructionist, Reform and Conservative. The funds come from the general Jewish community and from the Orthodox community as well. A local Chabad rabbi is put in charge of the day-to-day operation. Flash forward 25 years. The Orthodox community begins to to its conversions at other, privately owned mikvas. The Chabad rabbi, still in charge of the community mikva, decides to ban all conversion immersions, meaning the non-Orthodox converts have nowhere to go to immerse. …“This is a Chabad-based cabal,” Rabbi Lionel Moses of the Conservative Shaare Zion Congregation charged. “This is a community mikvah built with community money, which has been a symbol of co-operation and pluralism across the religious spectrum. Rabbi Mordecai Zeitz of Congregation Beth Tikvah in Dollard des Ormeaux believes Mikveh Israel changed its policy because, for over a year, those undergoing Orthodox conversions under the Rabbinical Council of Montreal’s beit din had been using another mikvah located at the Sephardi Hechal Shalom Congregation in St. Laurent. That meant, he said, that most conversion immersions taking place at Mikveh Israel during that period were non-Orthodox. Rabbi Michael Whitman, spiritual leader of Adath Israel-Poale Zedek Congregation, who is president of the Rabbinical Council of Montreal representing the city’s Orthodox synagogue rabbis, also was critical of the mikvah’s new policy. Rabbi Whitman pointed to a 20-year-old ruling by Rabbi Moshe Feinstein in New York that allowed non-Orthodox converts to use a mikvah built by the community, in the interest of harmony. [Chabad's] Rabbi [Itche Meir] Gurary, however, dismissed these concerns and rejected any notion of a hidden agenda. Montreal's haredi-dominated Vaad Ha'ir had no comment on the issue, claiming not to be involved in any way. What is happening here is clear. 25 years ago, Modern Orthodxy was the dominant force in Montreal's Orthodox community. That is no longer true. MO Jews left Montreal in droves during Quebec's various attempts at secession while, at the same time haredim have flocked to the city, unconcerned about a possible Francophone takeover because haredim operate outside of the larger communities they live in. Yiddish is their lingua franca and the surrounding society is always kept distant. Most MO Jews in Montreal were and are native English speakers and worked outside the Jewish community, interacting regularly with non-Jews. In every community where haredim have become dominant, these types of thuggish issues surface. It was how haredim behaved in Brooklyn after reaching domiance there in the late 1970s, and the same story is repeated from Manchester to Minneapolis to Jerusalem. And this is the future, at least as far as the Jewish community is concerned. Before long, your JCCs and community institutions will fall under haredi control or influence. The Judaism you belive in will be trampled underfoot, and your children – if you remain in the Jewish community – will be indoctrinated by haredim. Fight now or leave now, but for God's sake do not remain passive. The time is running very short. [L]abelling books kefirah and someone a kofer is well-within halachah, as is refusing to meet,if the claims are well-grounded. Read the position of Rabbi Akiva in Perek Chelek. In other words, a shomer Shabbat Jew with recognized smicha wrote a series of books that quoted Rishonim and later authorities. Gedolim labeled those positions heresy, and Rabbi Slifkin a heretic. They refused to meet with him or his representatives. And, when pushed by others to explain themselves, they were left with saying that what was permissible for Maimonides or Nachmanides or Rabbi Samson Rafael Hirsch to believe is not permissible for us. These rabbinic fools tried to destroy Rabbi Slifkin. They did so with no due process granted to the man they condemned. And who defends their misbehavior? An RCA rabbi. This is Orthodox Judaism. People, run away from it as fast as you can. Hundreds of ultra-Orthodox on Monday blocked a road leading to the Ramat Beit Shemesh neighborhood near Jerusalem, set fire to garbage carts and hurled stones at police officers who were dispatched to the area. The new family moved to Ramat Beit Shemesh a number of weeks ago. The other families in the neighborhood decided the newcomers were "not religious enough" and began harassing them in a bid to prompt them to move somewhere else. This is not the first time ultra-Orthodox people are rioting in the area. In September, clashes erupted between police officers and about 100 ultra-Orthodox residents next to a neighborhood pizzeria. The protestors arrived at the pizzeria and demanded that its owner close it, claiming that he was selling pizzas to inappropriately dressed teenagers. A policewoman was lightly injured during the clashes and an ultra-Orthodox man was arrested. Two and a half years ago, neighborhood residents demonstrated against a new bus route connecting the town of Beit Shemesh with ultra-orthodox neighborhoods in Jerusalem. "The buses are not modest enough," the ultra-Orthodox residents claimed, while attempting to block the neighborhood's main road. Police removed the protestors from the area and arrested seven ultra-Orthodox men on suspicion they tried to disrupt buses. Which way to the stone age? Just follow the thugs with the dirty black hats. Russia's neo-Stalinist president and Chabad "chief rabbi" of Russia Berel Lazar's good friend Vladimir Putin has cut all gas to Ukraine, potentially freezing to death many elderly people there and in the Baltic states. Ukraine's crime? Democracy. …Like most of the Baltic countries, Estonia has relied on Russia to provide a vast amount of its energy supply throughout the years. But that relationship has soured somewhat with Estonia. A far worse situation is brewing in some of the former Soviet Union States. For example, the Ukraine has been a thorn in the side of Russia and the Putin administration. Now Russia is pursuing a geopolitical goal to block Ukraine from joining NATO and the E.U. something that Ukraine certainly wants. The Kremlin is well aware that energy is a tried and tested political weapon and they are ready and willing to use it. When I turned on the evening news last night from Russia, watching from my home in Estonia, the first three stories pertained to the Putin administration, energy and the cold, cold winter. The Kremlin is seeking control over pricing of the vast pipelines that crisscross the Ukraine. These vital pipelines are at present the primary gateway for the wealthy European market. The Kremlin has Rubles on the brain and sees Ukraine as a major impediment to the riches that lie beyond. Other former Soviet Union States like Belarus have capitulated to Russia and continue to given Russia a cut-rate, bargain basement deal. As a reward Belarus will continue to pay only $49 a thousand cubic meters for Russian Gas in 2006. On the contrary, the defiant Ukraine is getting socked with an increase from $50 per thousand cubic feet to a whopping $160-$230 price tag in 2006. Other countries feeling the energy pinch include: Moldova ($150-$160), Estonia ($120-$125), Lithuania ($120-125) and Latvia ($120-$125). It could be a very long and cold winter for many of these countries citizens that live on fixed incomes. Capitalism has provided many comforts not seen during communism and war, but has also brought with it the growing pains of a free market economy. In an attempt to further legitimize its position, the Putin government and the state owned Rosneft, (formerly Yukos), is seeking out Western leaders to put a better face on the situation and encourage Western investment in the major Russian energy company. When the Kremlin seized Yukos and jailed its leader Mikhail Khordokovsky in Siberia for "tax evasion," the wheels of change were set in motion, and they continue to roll on. Another major shift just occurred as ousted German leader Gerhard Schröder, plagued by unemployment in his country, decided not to become a statistic himself and accepted a job in a top post with Gazprom the giant energy company in Russia. Ironically Gazprom is behnd an ambitious pipeline project between Russia and Germany that Schröder championed while in office. Actually, it´s not that ironic, just disturbing. In a similar move, the Kremlin is purportedly trying to entice former U.S. Commerce Secretary Donald Evans to come on board as the new chairman of Rosneft. Clearly all of this is an attempt to calm the fears of investors from the West ahead of the Rosneft initial public offering set for 2006. Russia took Europe to the brink of a winter energy crisis yesterday when it carried out a Cold War-style threat and halted gas deliveries to Ukraine, the main conduit for exports to the West. With a quarter of its gas supplied by Russia, Europe is facing serious disruption and price rises for as long as the dispute rumbles on. Moscow turned off the tap at 10am after Ukraine refused to sign a new contract with the Russian state monopoly Gazprom quadrupling prices. Critics of the Kremlin say the rise was punishment for the Orange Revolution in 2004 which brought in a westward-leaning government that promised to remove Ukraine from the Kremlin's sphere of influence. The American State Department said that "such an abrupt stop creates insecurity in the energy sector in the region and raises serious questions about the use of energy to exert political pressure". The European Union has called an emergency meeting of energy ministers on Wednesday. Britain is less vulnerable than mainland Europe because it does not receive direct supplies from the former Soviet bloc. But as other countries seek to shore up their reserves, less gas is likely to be pumped through the pipeline that links the Continent with Britain. That could mean higher prices and, if there is no quick resolution, possible breaks in supplies. The European Commission says that most countries have between a week and two months' emergency reserves. Ukraine has upset Moscow by pushing to join the EU and Nato. However, Russia insists that the price rise merely brings Ukraine in line with the price that most of Europe pays: about $240 per 1,000 cubic metres. President Vladimir Putin adopted almost warlike terms when he spoke on television as the hours ticked by before the ultimatum expired. "If no clear response [from Kiev] follows, we will conclude that our proposal has been rejected," he said. If Ukraine's reserves run out, it could be tempted to siphon off gas intended for other countries. It claims the right to do so in lieu of transit fees. The cut-off coincided with Russia assuming the rotating presidency of the G8 leading industrialised nations. In Britain, millions of families started paying higher fuel prices yesterday. Scottish and Southern Energy raised prices by 13.6 per cent, adding approximately £50 to the average annual bill, while electricity charges will go up by 12 per cent, or about £30 a year. Npower puts its rises into effect today, adding 14.5 per cent for gas and 13.6 per cent for electricity. This thug is Berel Lazar's close friend. Lazar shills for him. Lazar even intercedes for him in Washington. Wake up Jews – Chabad is your enemy. UPDATE: Russia restores gas to central and western Europe – but not the Ukraine. The Financial Times reports after the jump. Although Robinson said she would fax a copy of the police report and the complaint she filed with the Lakewood Police Department’s Internal Affairs unit to the Tri-Town News in order to prove her claim, no documents were ever provided and she did not return subsequent calls requesting them. This is not a surprise. Robinson's medical records released so far do not support her claim. She promised to release the full medical record, which she claimed does support her. She has not done so. At several Lakewood Township Committee meetings held after the incident, non-orthodox Jewish residents said orthodox Jews did not respect the authority of police officers, such as Menck, who were just doing their job. Rabbi Shain actively supported Robinson in her claims against the police, which conveniently "surfaced" a few days before Rabbi Bursztyn's trial was to begin. Rabbi Shain also made claims of "many witnesses" supporting the rabbi and proving the police wrong. None have ever gone pubic, and Rabbi Shain has refused repeated requests to name them or to provide any proof of their existence. Pinchas Goldschmidt, Moscow's Swiss-born Chief Rabbi, is now back in the Russian capital after having his one-year multi-entry visa revoked without explanation on 27 September (see F18News 6 October 2005 http://www.forum18.org/Archive.php?article_id=668). Speaking to Forum 18 following his 8 December return to Russia, Rabbi Goldschmidt said that he now holds a one-month single-entry religious work visa supported by an invitation from "one of the Jewish communities." Goldschmidt's Moscow Jewish Religious Community is affiliated to the Congress of Jewish Religious Communities and Organisations of Russia (known as KEROOR). Rabbi Goldschmidt confirmed to Forum 18 on 16 December that he thus has to leave Russia again in early January, but added that he hopes to re-enter holding a one-year multi-entry religious work visa. He declined to comment on the possible reasons for his September deportation. Immediately following that incident, there were suggestions in the Russian media that it might be linked with the Moscow rabbi's possession of a business rather than a religious work visa. A faxed reply from the Russian Foreign Ministry to Forum 18's 29 November query about his predicament (see F18News 30 November 2005 http://www.forum18.org/Archive.php?article_id=697) appears to support this view. Dated 5 December, it maintains that Goldschmidt visited Russia on business visas supported by invitations from "various commercial structures" from 2003 - in particular, the SA-SEV "financial-trade" company during 2004-05. According to the Russian tourism website turist.ru, SA-SEV is a Moscow-based limited company which received licences to offer tour agency and tour operator services in April 2002. Pointing out that his wife Dara teaches in a Jewish school in Moscow, Rabbi Goldschmidt maintained to Forum 18 that his annulled visa had not been supported by a business as such, but an organisation offering services to educational institutions. The Foreign Ministry Information and Press Department's assistant director Mikhail Troyansky, however, maintains that, while holding business visas, Goldschmidt "actually visited Russia to conduct professional religious activity," a fact confirmed in writing by the Swiss Embassy, Adolf Shayevich ("the Chief Rabbi of Russia according to KEROOR") and his own public appearances as Chief Rabbi of Moscow. As a result, continues Troyansky, Goldschmidt "repeatedly violated" Article 26, Part 2 of the 1996 law on entry to and exit from the Russian Federation, which states that foreign citizens may be barred from entering the country if they "submit false documentation or knowingly provide false information about themselves or the purpose of their visit." This, according to the Foreign Ministry's reply, is the reason why Goldschmidt was prevented from entering Russia. Troyansky concludes, however, that all bars on Rabbi Goldschmidt's travel to Russia have been lifted. "Goldschmidt may obtain a visa at any Russian consulate by presenting all the necessary documentation, including an invitation from a Russian religious organisation issued in accordance with the legally prescribed procedure via the Interior Ministry." He duly received his one-month visa on 6 December. Lev Krichevsky, Moscow correspondent for the Jewish Telegraphic Agency (JTA), reported a quite different reason for Rabbi Goldschmidt's expulsion. In a 22 November JTA article, he noted that, according to Russia's Interior Ministry, Rabbi Goldschmidt was being kept out of the country "for national security reasons." Contacted by Forum 18 on 9 December, Krichevsky confirmed that a 9 November Interior Ministry official letter he saw – to which he no longer had access – explicitly referred to Article 27, Part 1 of the 1996 law on entry to and exit from Russia as the reason for Goldschmidt's visa annulment. This provision indeed states that foreign citizens may be prevented from entering Russia "for the purposes of ensuring state security." While a spokesman for the Foreign Ministry told Russia's Interfax news agency on 28 September that they were "examining the circumstances" connected with the annulment of Rabbi Goldschmidt's visa, the Interior Ministry is qualified to comment on the case as it took over the handling of foreign religious workers' visa applications from the Foreign Ministry at the end of 2002. Tankred Golenpolsky, editor of the International Jewish Newspaper, speculated to Forum 18 in early October that Rabbi Goldschmidt's expulsion may actually have been connected with a property dispute between Moscow's Choral Synagogue and the Russian Jewish Congress under its president since November 2004, [Chabad-affiliated oligarch] Vladimir Sluzker (see F18News 6 October 2005 http://www.forum18.org/Archive.php?article_id=668). On 10 November [non-Chabad oligarch] Vyacheslav Kantor was elected president of the Russian Jewish Congress in place of Sluzker. Rabbi Goldschmidt is the 53rd foreign religious worker – and the first Jew - known to Forum 18 to have been denied entry to Russian since March 1998 (see F18News 7 September 2005 http://www.forum18.org/Archive.php?article_id=644). The Russian authorities' expulsion of foreign religious workers is not usually explained. However, Jeffrey, Susan and Jordan Wollman, a US evangelical missionary family previously based in Kostroma, were informed by the Foreign Ministry in July 2002 that they had been denied visas the same month specifically under Article 27, Part 1 of the 1996 law on entry to and exit from Russia. Without specifying which part, the Foreign Ministry subsequently stated that the visa of Irkutsk-based Polish Catholic bishop Jerzy Mazur was revoked in April 2002 "strictly in accordance with" Article 27, and that Canadian Salvation Army officer Geoff Ryan, based until September 2000 in Rostov-on-Don, was barred from travelling to Russia under the same provision. A Krasnodar-based lawyer representing Swedish evangelical missionary Leo Martensson, whose Russian visa was revoked in September 2002, was reportedly told by the Foreign Ministry in early 2004 that he posed a security risk. Rabbi Goldschmidt's case demonstrates that it remains unclear what foreign religious personnel are entitled to do in Russia. Officially employed as a computer studies teacher, US citizen Craig Rucin was involved in unpaid religious work in his spare time when deported from Udmurtia in 2001. Officially a religious worker with the Church of Christ in Volgograd, by contrast, US citizen Charles Landreth was ordered to leave Russia by local police in September 1999 on the grounds that he was breaking the law by working in orphanages and "having social interaction outside church activities." I suspect Nicole Robinson's lack of medical documentation for her charges of police brutality, her constantly shifting story and the lack of support she garnered outside the haredi community (Robinson is not Jewish), influenced Rabbi Bursztyn decision to admit his guilt rather than go to trial. Haredim, including Rabbi Yudel Shain, claim there were many unnamed "witnesses" to support Rabbi Bursztyn's claim of police brutality. They also claim the same for Nicole Robinson. Haredim also claim the police and city "refused" to interview said witnesses for Officer Menck's Internal Affairs hearing. Yet, somehow, when these many "witnesses" could have to testified (but under oath and with the risk of perjury) and supported the rabbi's claims, the rabbi pleads guilty and no "witnesses" testify. A rabbi, whose altercation with police earlier this year sparked protests in Lakewood's Orthodox Jewish community, has pleaded guilty to obstruction of justice in connection with the incident in Lakewood. Rabbi Yosef Bursztyn, 63, of Sixth Street, Lakewood, pleaded guilty Tuesday to the disorderly persons offense before Superior Court Judge Edward J. Turnbach, who imposed $125 in fines, said Executive Assistant Prosecutor Ronald F. DeLigny. Bursztyn could have faced up to up to six months in jail and fine up to $1,000. Bursztyn admitted he failed to comply with a directive of Lakewood Officer Erik Menck on June 26 while Menck was performing an official function, court documents said. Police said Bursztyn reached inside Menck's patrol car after the officer had stopped the rabbi's niece for allegedly tailgaiting another vehicle. Bursztyn's arrest sparked protests in Lakewood's Orthodox community. Menck was cleared of any wrongdoing in the incident. If you have not yet done so, read my earlier coverage of this incident, especially the Lakewood Shopper's "report" on the Robinson affair. This haredi-owned tabloid has been shameless in its attempts to whip up hatred for the Lakewood Police. It should also be noted that yesterday's (failed) rally to garner support for Robinson outside the haredi community was conveniently scheduled for the day before Rabbi Bursztyn's court appearance. Now, why would that be? A protest rally to spotlight a woman's claims she was beaten by a township police officer drew only a handful of people Tuesday to Town Square. Nichole Robinson, the woman who says she was beaten last month by embattled Patrolman Erik Menck, said the rally was canceled because Public Safety Director Al Peters told her that organizers needed a permit. Peters said he told Robinson that no permit was necessary. The rally will be rescheduled for next month, Robinson said, but the disagreement is her latest with the township since she went public last week with allegations of police brutality. On Nov. 20, four police officers, including Menck, went to Robinson's Coventry Square town house to question her about a disorderly persons call earlier that day. Police say Robinson attacked Menck while he attempted to get a statement from her. Robinson was then taken to Kimball Medical Center for treatment of asthma, police add. Robinson, 29, says she does not suffer from asthma. After the incident, she was charged with aggravated assault on a police officer and her father, Horace Cody, 66, was charged with interfering with an arrest. Robinson later filed a formal complaint against Menck, she said Tuesday. She also has retained a lawyer, who said last week he plans to sue the township for damages. Robinson said Tuesday she has received a lot of support from members of the Orthodox Jewish community, some of whom distrust Menck because he charged a respected rabbi with assault over the summer. Menck charged Rabbi Yosef Bursztyn, 62, with aggravated assault on a police officer and resisting arrest after a physical confrontation on Forest Avenue on June 26. An Internal Affairs investigation cleared Menck of wrongdoing, but the altercation sparked tension between some in the Orthodox community and the Police Department. Bursztyn's charges are still pending at the Ocean County Prosecutor's Office. Robinson has changed her story several times and her claims do not match the doctor's diagnostic notes from the night of the incident. She has promised to release medical records to back her claim, but has failed to do so. Yet it appears that the haredi community is still behind Robinson and may be giving her more than moral support in an attempt to keep Rabbi Bursztyn out of jail. Smearing a police officer is apparently kosher for that purpose. Extensive coverage of this incident can read here. Satmar Shul Brawl: A Return To The Garden Of Eden? The four were initially charged with felony assault after pouncing on victim Jacob Brach last December after he burst into the temple and sat in a seat reserved for the Rabbi Zalman Teitelbaum. Also attacked was Brach's pal Leon Teilebaum. Brach suffered a broken leg and Teilebaum a broken ankle. Zalman Teitelbaum was appointed by his father, Grand Rabbi Moses Teitelbaum, to run the Williamsburg congregation. But Brach is among followers of Zalman's older brother, Rabbi Aron Teitelbaum, who believe he is entitled to run the synagogue. Two lawsuits aimed at getting the civil courts to settle the vicious battle are still pending. Yesterday, prosecutor John Omara told Brooklyn Supreme Court Justice Anne Feldman that he accepted the lesser pleas because Brach, who has a federal conviction, was "provocative" and offensive by deliberately placing himself in the seat reserved for Zalman. Thousands of incensed Zalman followers packed the synagogue after the incident. The four were charged with attacking Brach with a door and a baton and choking, kicking and punching him. "We had two police officers who will testify they were present when Mr. Brach was involved in praying," Omara said in court. "There was a lot of commotion. They broke down the door and began attacking." He said if the case went to trial, the victims would be able to identify the four men, and a retired cop who took pictures of the men would testify they continued to assault Brach even after police arrived. Krausz's lawyer George Farkas was gratified Omara described the scene as he did, noting that Brach had committed the ultimate affront and provocation to Zalman's followers by sitting in a place so holy they forbid their children from touching it. A traditional explanation for the Sin of Adam and Eve is that Adam told Eve that God had forbidden them from touching and eating from the tree on penalty of death, when in fact God had only forbidden eating. The serpent pushed Eve, she touched the tree and did not die. The serpent then said, if you can touch the tree and not die, why not eat from it, too? You will become like God! And so Eve ate. The point is that adding onto a law without specifying that this is only a fence and not the law itself leads to greater sin. And so is the case here. When one treats a rabbis chair as "so holy they forbid their children from touching it," one elevates a chair to a presumed status it does not in fact have. This led to tremendous chillul hashem, desecration of God's name, and the violation of real biblical commandments. This is the problem with the hasidic movement as a whole. It elevates customs to a place higher than law. This can only lead to destruction. And so it has. [Oligarch Roman] Abramovich, who had business ties with [Chabad Oligarch Lev] Leviev, recruited the Israeli diamond merchant for a struggle on behalf of Putin and against Gusinsky. In return, Leviev received the support of Putin, who in 2000 was elected president of Russia. That support made it possible for Lazar to receive Russian citizenship in record time and to be recognized in practice as the chief rabbi of Russian Jewry. Shayevich was shunted to the sidelines. The Jewish "federation" of Lazar and Leviev became the darling of the government. This was clearly manifested when President Putin took part in a resplendent ceremony to dedicate the FEOR center in the Marina Roscha neighborhood in 2001. A plaque at the entrance to the building lists the donors. They include Leviev, his partner Gaydamak, [Chabad oligarch Vladimir] Slutsker [please see below] and other oligarchs. But at the top of the list is Abramovich. He donated $5 million for the construction of the building. Lazar and FEOR left REK. In 2002 Gusinsky was forced to leave Russia and then to sell his assets there. The authorities launched an investigation against him for tax violations. He based himself in Israel and Europe and invested in the Israeli daily Maariv and in the local Russian press; during the past year he has spent most of his time in the United States. He was replaced as REK president by Leonid Nevzlin, Khodorkovsky's associate. However, a year later, when it became apparent that the Putin government supported FEOR, Nevzlin realized that his place at the head of an organization identified with Gusinsky, who is loathed by the government, was liable to be detrimental to him and to affect Yukos as well. Nevzlin resigned and the deterioration of REK has continued apace ever since. … Rabbi Lazar talks of an organization that has 200 communities across Russia and which provides both spiritual support (sacred articles, religious services, rabbis) and material backing (food, education, health, financial aid) to hundreds of thousands of Jews. "In Moscow alone," he says in an interview, "130,000 Jews have ties with us." There are some who are skeptical of these figures. Two years ago, when Tzipi Livni, then Israel's immigrant absorption minister, asked FEOR for a list of these Jews, her request was rejected with the slightly peculiar explanation that this would be a violation of privacy. Slutsker's major and most talked-about dispute is with Rabbi Goldschmidt. At stake is control of a property - the headquarters of the Russian Jewish Congress, located in a building that was transferred to the ownership of the Jewish Community in Moscow, which is headed by Goldschmidt. As a religious organization, the community has a tax-exempt status. "After some time," Slutsker notes, "Rabbi Goldschmidt asked us to pay him rent as though the offices actually belong to him. Naturally, I and the congress refused to pay." Goldschmidt's confidants say that the request was not for rent, but payments to cover the costs of ongoing maintenance of the structure, such as electricity. Be that as it may, on September 15, 2005, Slutsker, to his "great surprise," received a fax from a rabbinical court, the Jerusalem Court for Civil Law and Ancestral Law, in which he was notified that he and the congress were being summoned to din Torah, a lawsuit in which judgment is given according to the strict letter of traditional Jewish law. The plaintiff was the "Jewish Community of Moscow." "I did not even bother to answer them," Slutsker says. "I do not recognize the authority of a court in Jerusalem to address a commercial dispute in Moscow. What connection do they have with me?" Ten days later, in one of those strange coincidences, Goldschmidt was deported from Russia. "There is absolutely no connection," Slutsker states. Moscow’s chief rabbi returned to the city after being barred from Russia since September. Pinchas Goldschmidt landed at a Moscow airport Thursday evening. His visa had been cancelled upon arrival at the Moscow airport in late September, with no reason given, and he had been denied a new one for nine weeks. He received a one-month visa earlier this week, but said he hoped to extend his stay. Goldschmidt told JTA he had no problems at passport control in Moscow on Thursday, but would have to leave Russia later this month to get a new visa. A Swiss citizen and Russian resident for nearly 15 years, Goldschmidt previously received one-year visas. All the vitriol hurled at Rabbi Slifkin is misdirected. The 'gedolim' created this mess by their boorish behavior, disregard of halakha and downright ignorance of science, history and Jewish theology. Any animus on their part should be wholly self-directed. Make no mistake about it. Being a haredi now means believing the entire universe is less than 6000 years old and that all of science is an elaborate fraud. And this applies to Aish HaTorah, Ohr Somayach, Discovery and Chabad just as much as it applies to Lakewood, Mir and Ponevitch. The 'gedolim' have killed Judaism. *UPDATE: Rav Shmuel is claiming to be concerned about a new article posted by Rabbi Slifkin on his website. 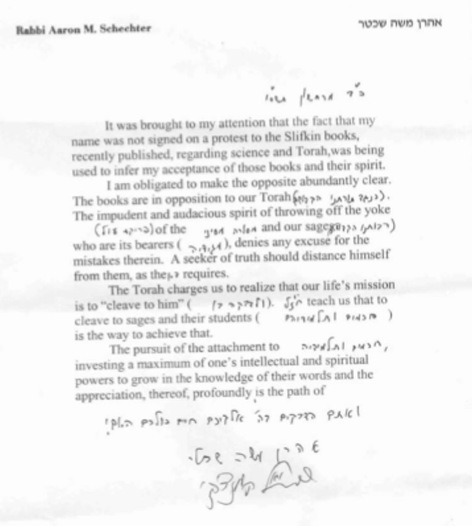 The books and original views were not the object of his signature appended to Rabbi Schechter's letter. The problem is the letter stands by the ban of the books and of Rabbi Slifkin. The other problem is Rabbi Slifkin's only new piece is on elephants and contanins nothing different from his earlier work. In other words, Rav Shmuel is apparently lying. 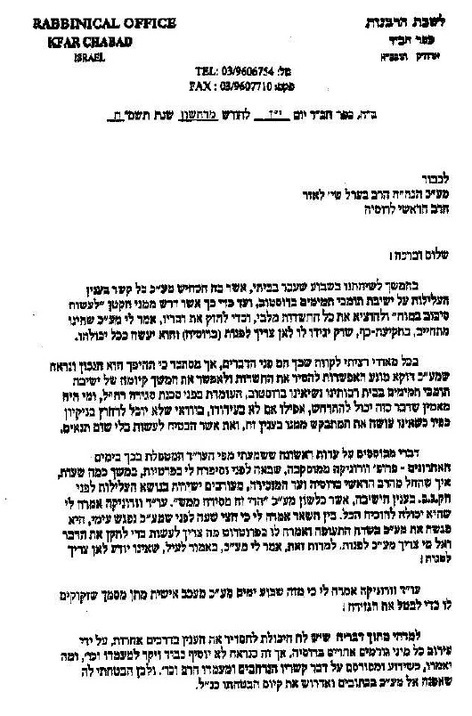 Reports are also coming in that point out that Rav Shmuel did not give Rabbi Slifkin a chance to respond to charges against him before Rav Shmuel made them public, and that Rav Shmuel violated other aspects of halakha by issuing this letter. Such little men with such big hats. "Let us resolve the internal political problems of Russia ourselves," Mr. Putin said this summer, criticizing nongovernmental organizations involved in what he called political activities. Mr. Putin has long faced criticism for strengthening his political authority, despite his avowed commitment to democracy, and the legislation prompted still more criticism. "This is the last sector of civil society that has not fallen under government control," Aleksandr B. Petrov, the deputy director in Moscow for the international group Human Rights Watch, said at a news conference held Tuesday in hopes of persuading the Parliament to reject or at least amend the legislation. The critics of the law say that Russia's restrictions would go beyond those imposed on nongovernmental organizations by most of the developed world, including the other members of the Group of 8, of which Russia is a part. Earlier this year, the director of the Federal Security Service, Nikolai Patrushev, accused Western organizations - including the Peace Corps and the British medical charity Merlin - of being fronts for espionage. "Under the cover of implementing humanitarian and educational programs in Russian regions, they lobby for the interests of certain countries and gather classified information on a wide range of issues," Mr. Patrushev told members of Parliament in May, referring to private organizations. His remarks prompted unusually strong public rebukes from the United States and Britain, but the legislation he called for at the time became the basis for what Parliament adopted Wednesday despite a further outpouring of criticism once the bill appeared on the agenda. It passed by a vote of 370 to 18. Three members abstained, while 56 did not vote. Two former members of Congress, John Edwards and Jack Kemp, who together are overseeing a task force about American policy on Russian issues for the Council on Foreign Relations, wrote to Mr. Bush last week urging him to protest "in the frankest possible terms." This also explains the expulsion and ban of Moscow's non-Chabad chief rabbi Pinkhas Goldschmidt, and Lazar's complete silence on the issue. Lazar, it seems, has never met a dictator he didn't like. Thugs like the company of other thugs. Chabad should be ashamed. As part of the same bargain deal, the rabbi's wife, Mazal, retracted her previous denials and admitted on Wednesday that she knew of the abduction and did not report it to police. She will, nevertheless, not be convicted. Several months ago, Rabbi Amar visited the Former Soviet Union. Traveling with Lev Leviev, the Chabad-backer and oilgarch who pays for most of Chabad's activities in Russia, and Berel Lazar, Chabad's "chief rabbi" of Russia, Rabbi Amar was scheduled to visit a non-Chabad yeshiva. He did not show up. Staff and students waited in assembly for hours as they were assured by the Chief Rabbi's staff that he would be arriving shortly. He never did. He also never explained his absence or apologized, a source close to the yeshiva told FailedMesiah.com. Previous reports: Here, here and here. Moscow, September 28, Interfax - The Russian Foreign Ministry is investigating the motives behind a decision to cancel an entry-visa issued to Moscow Choral Synagogue Rabbi Pinchas Goldschmidt, ministry spokesman Mikhail Troyansky told Interfax on Wednesday. "At the moment, we are investigating the circumstances surrounding the annulment of Rabbi Goldschmidt's visa", Troyansky said. A Moscow source told Interfax that Russia recently adopted new visa regulations for foreign clergymen. The new rules allow clergymen from abroad to come to Russia for religious activities only at the invitation of an officially registered centralized religious organization, he said. The source said that Goldschmidt is reported to have been invited to Russia by a business group. Sources in Moscow told Interfax that Goldschmidt, who arrived at Moscow's Domodedovo airport from Israel on September 27, was not allowed to enter Russia and was forced to return to Israel. Putin only recognizes Chabad and its front group the Federation of Jewish Communities (FJC). That would appear to mean that Rabbi Goldschmidt, Moscow's long-serving Chief Rabbi and a pro-democracy opponent of Putin and Lazar, would only be allowed back into Russia if he is officially invited by Lazar's Chabad-controlled FJC. Putin is an anti-democratic thug. Lazar and Chabad are his lap dogs. So far, the Jewish media is silent. UPDATE: Miriam Shaviv has an interesting take on this development here. The chief rabbi of Moscow's main synagogue said Russian border guards had denied him entry to the country on Tuesday when he returned from a trip to Israel. Rabbi Pinkhas Goldschmidt, speaking on Ekho Moskvy radio, urged the authorities to review his case and let him return to Russia. He said the border guards told him that his Russian visa had been annulled, but gave no further explanation. He flew back to Israel after being denied entry. Goldschmidt, chief rabbi at the Moscow Choral Synagogue, said he hoped the incident was a misunderstanding. Adolf Shayevich, Russia's chief rabbi, said that his Congress of Jewish Religious Organizations and Associations asked the Foreign Ministry for an explanation of what happened to Goldschmidt but had not yet received an answer. "It was unexpected for all of us, since he never has had any problems," Shayevich told Ekho Moskvy. It seems clear – Putin bans a political opponent and does a favor for Chabad at the same time. And the Jewish media? If past examples are any indication of the future, expect near silence. What you do read will probably contain a quote from Lazar supporting Goldschmidt. Lazar may even 'intercede' with the Foreign Ministry. Then, if Goldschmidt is allowed back in, Lazar can claim to have helped. And if not, Lazar did his 'best.' But Chabad's long campaign to crush rabbis not under its direct control will not be reported in any detail. Too many uncomfortable threats come with printing uncomfortable news. UPDATE: Miriam Shaviv has Ma'ariv's take – which largely agrees with mine – here. The controversy over a disputed circumcision ritual could affect the mayor's race in New York City, as some members of the Hasidic community are promising to protest any restrictions placed on the mohel in question. Rabbi Yitzchok Fischer has been the subject of an investigation by the city's health department since three infants tested positive for herpes simplex, one of whom later died. At issue is whether Fischer transmitted the virus to the infants via direct oral suction of the circumcision wound — a method known as metzitzah b'peh, a traditional ritual still prevalent in many Orthodox communities. Since the investigation was first revealed in February, the department has obtained a court-issued temporary restraining order "consented to by the mohel" that "prevents him from performing the metzitzah b'peh," according to a lawyer heading the city's legal action on the case. The attorney added that "the proceeding brought by the city to compel the mohel to provide a blood sample has been adjourned several times." The health department and Mayor Michael Bloomberg have stated repeatedly at meetings with ultra-Orthodox leaders that a general ban on the practice is not in the cards. One such meeting, with 22 Hasidic rabbis, took place August 11 at City Hall. The issue of regulating some or all ritual circumcisers as a means of preventing herpes is a complicated issue, since an estimated 90% of the American population carries the antibodies for the virus and it is hard — perhaps impossible — to predict which individuals are more likely than others to spread it. Some groups, including the Modern Orthodox-dominated Rabbinical Council of America, have recommended using a sterile tube and gloves to avoid direct oral contact — but that option has been rejected by Hasidic sects and by [many] other ultra-Orthodox communities as religiously unacceptable. See this article for a rundown of the four major halakhic positions on metzitza b'peh. 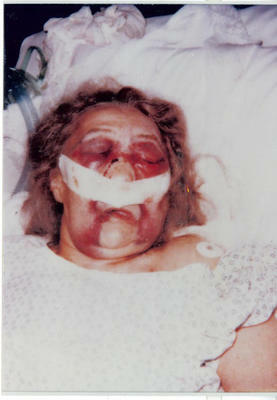 Chana Gourary, eldest daughter of the 6th Lubavitcher Rebbe Yosef Yitzchok Schneersohn and sister-in-law of the 7th rebbe Menachem Mendel Schneerson, after being beaten by a hasid of the 7th rebbe. Mrs. Gourary was then in her mid-eighties. In a discussion on Mentalblog, the beating of Chana Gourary by a Lubavitcher hasid was mentioned. Chana, the daughter of the 6th rebbe of Lubavitch and the sister-in-law of the 7th and then current rebbe Menachem Mendel Schneerson, then in her mid-eighties, was beaten on Shabbat by a student of the central Chabad-Lubavitch yeshiva. Mrs. Gourary's husband, Rabbi Shmaryahu Gourary, had been the operations head of the yeshiva since its days in Poland before WW2. Why was Mrs. Gourary beaten? Because, as one of the two surviving children of the 6th rebbe and as the mother of his only grandchild, Mrs. Gourary wanted her family's share of the 6th rebbe's estate. The 7th rebbe, Mendel Schneerson, opposed this. When it became clear that Mrs. Gourary and her son Barry were taking items from the estate, the Rebbe became infuriated and spoke out against the 'thieves.' An enraged follower then went to Mrs. Gourary's apartment and assulted her. The Rebbe refused to go to a neutral beit din to resolve the dispute and, instead, in violation of normative halakha, brought the case to secular court which eventually found that the estate belonged to 'all hasidim' and was not the personal property of the 6th rebbe or his descendants – a decision that would not have been reached in an impartial beit din. To this day, Chabad keeps much of the meat of the estate under lock and key, unavailable for viewing by researchers and hasidim alike – hardly the public use the secular court envisioned. After the attacker left her apartment, a badly injured Chana Gourary phoned her sister Chaya Mussia, the Rebbe's wife, for help. It was Shabbat. Phones are not used or answered. Yet Chana called and Chaya Mussia answered the phone. This was before caller ID or special ring tones. Chaya Mussia got help. Word of the attack spread through Crown Heights. Chabad 'authorities' quickly put the attacker in seclusion and, on Shabbat, arranged for a flight to Israel on the first available plane. By the time the police arrived looking for him, the attacker was already out of US airspace. He married and lives a normal life in Israel as part of the Chabad-Lubavitch community there. He has not been shamed or ostricized in any way. In the 1970's an elder member of the Chabad-Lubavitch Va'ad HaRabbonim refused a direct request from the Rebbe to excommunicate an Israeli politician who had disregarded the Rebbe's wishes. Rabbi Rivkin pointed out that there were no halakhic grounds for the excommunication and respectfully refused to do the Rebbe's bidding. Similar to what would happen in the Gourary case, the Rebbe publicly and viciously spoke out against the one who would not sign. The Rebbe also posted the excommunication order signed by the other members of the Va'ad HaRabbonim so it would be clear to all who that "one" was. Rabbi Rivkin was spit on in the streets, called a Nazi, had his home covered with graffiti, his windows broken. He received late-night harassing phone calls. He was threatened. An elderly man, Rabbi Rivkin could not handle the strain. He had a stroke, fell down his stairs and died. 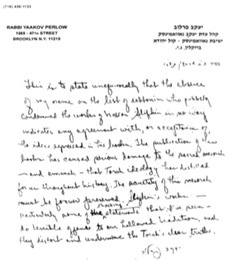 The Rebbe denied his hasidim had any role in the harassment of Rabbi Rivkin, an odd contention because, a) The Rebbe himself publicly and in direct violation of Jewish law harassed Rabbi Rivkin, and b) much of the graffiti was in Yiddish. No one who learns Chabad hasiddus could do such a thing, the Rebbe told reporters. Only a few years later, another hasid of the Rebbe, a man who studied in his yeshiva and learned much Chabad hasidut, beat a defenseless elderly woman to the point of death. As before, the Rebbe was unmoved and unrepentant. It should be recalled that the Haredi newspaper "Mishpacha" (Family) published three months ago the results of a study that found that there was no kabbalistic basis for the pulsa denura ceremony. It is a ceremony that was invented in the early years of Israel's statehood by one of the then-leaders of the Haredi public, who made an especially dramatic adaptation of the good old excommunication ceremony. Excommunication isn't such a scary matter, but pulsa denura sounds at least as mysterious as a voodoo rite. And all the rest is folklore. Who was that haredi leader? Rabbi Amram Blau, the leader of the vehemently anti-Zionist fringe group Neturei Karta. Following a storm of protest from Jewish groups and Israeli politicians, Russian officials have dropped a probe into a Russian Jewish group for publishing a religious Jewish book. But Russian and U.S. Jewish officials warn that those interested in human rights should remain vigilant to prevent similar incidents in the future. The probe was opened after an anti-Semitic letter was circulated earlier this year attacking the text of the Shulchan Aruch legal code as extremist and anti-Christian. The congress has published a short version of the medieval Jewish text. The probe astonished Israeli officials and heads of international Jewish groups, who said it reminded them of religious persecution under the czar and of religious disputations foisted on Jews by the Catholic church in medieval times. Mark Levin, executive director of NCSJ: Advocates on Behalf of Jews in Russia, Ukraine, the Baltic States & Eurasia, said it’s still unknown what prompted the incident. Levin said his group will emphasize in its meetings with Russian government officials that these types of probes are unacceptable. Direct pressure on Russia from Israel, local and foreign Jewish groups led to the decision to drop the case, observers in Moscow suggested. No probe could have been launched if Putin objected. Putin's government reacted weakly to the probe as it has to other antisemitic incidents. The announcement of the probe and of its "dropping" were timed to coincide with Olmert's visit. Olmert's visit was about trade between the two countries. Most graft and skimming done by senior Russian government officials is done from trade revenue. Something's rotten in Moscow and Chabad's "chief rabbi" is covering for it. The controversy over the investigation comes amid reports of growing Russian antisemitism and claims that government authorities have failed to mount a serious enough response to the trend. Some critics blamed Russian President Vladimir Putin, with a few observers even suggesting that the Kremlin had hoped to demand something from Israel in return for halting the investigation. But the leading Chabad official in the former Soviet Union and one of Russia's two chief rabbis — Berel Lazar — has forged close relations with Putin. At least in this case, the rabbi's influence appears to have paid off. "We spoke to the prosecutor general of Russia and we explained it to him clearly, that in today's age, to come out with such claims on Jewish texts... it's really senseless," Lazar told the Forward. "In no way does [the code] affect today the relationship between Jews and non-Jews." Lazar, however, claims that Putin is committed to the Jewish community. "I think it's not a secret of the relationship the president has with the Jewish community in general," Lazar said in a telephone interview with the Forward. "I must say that lately, after his trip to Israel and me standing by him throughout the visits, it's not a secret here in Russia." So, Berl Lazar becomes the "hero" of this sorry episode, Israel's role is reduced to a minor footnote, and Lazar uses his "stature" as a "hero" to promote (i.e., kasher) Putin. Does this sound familiar? Several dozen protesters, all of them children and teenagers, dashed into the road and stopped traffic in both directions. Police dragged about 10 protesters into a van. The protesters resisted and several escaped. A few minutes earlier, children under the age of 10 sat on the road, chanting "Jews do not evict Jews," the slogan of the pullout opponents, slowing traffic. …Prime Minister Ariel Sharon had instructed police and security forces to take all the necessary measures to prevent road blockages and publilc disturbances by right-wing activists. "We will not allow a fellowship of gangs to drag the country downhill," Sharon told ministers during a cabinet meeting earlier Wednesday. … "If there is one weak, dangerous, loose link that is guilty of this whole violent struggle, it is the Yesha Council," said Sharon aide Lior Horev. "They are acting like ostriches, looking the other way and taking no responsibility for the people whom they sent to the Gaza Strip, to that bloody hotel, and that girl who kicked the soldier in the head at the beginning of the week today, and today, people who are endangering people's lives." One of the drivers whose tires were punctured, Gilad Levy, a resident of the West Bank settlement of Kedumim and an opponent of the disengagement, voiced strong criticism of the activists' actions. "There are not the people of Yesha. These are members of the extreme right, with whom Yesha has no connection. They want to inflame passions like those whom are occupying the hotel in Gush Katif," a reference to young activists, many of them from the West Bank, who have barricaded themselves in former hotel in a settlement area of the Gaza Strip. "They're guys with simply nothing to do, guys who are bored." The oil and nails were strewn at two sites on the highway, one at the Shappirim junction, the other near Kfar Chabad, a focal point of anti-disengagement activity. Chabad's very own kadesha, Sue Fishkoff, has written a piece for the JTA on the fight for control of Chabad's main synagogue, 770. But in typical Fishkoff fashion, the article leaves out any hint of the true scope of Chabad messianism and at the same time makes it appear as if 770's gabboim do not represent the Crown Heights Community – a strange contention since all three were elected to their positions, and that election took place after this latest controversy surfaced. Fishkoff has made lots of money off her paean to Chabad, The Rebbe's Army, and perhaps even more money from speaking fees garnered from Chabad Houses worldwide, where she is an often-featured, well-paid speaker. Neither Fishkoff or the JTA disclose this lucrative relationship – a relationship dependent on Fishkoff's continued whitewashing of Chabad's darker side. Fishkoff is a kadesha, impure and simple. Tzemach Atlas has an interview with Boruch Gorin, Russian 'Chief Rabbi' Berel Lazar's spokesperson. In it, Gorin denies the Federation of Jewish Communities acts on behalf of Chabad and then justifies all questionable FJC actions by citing Chabad policy. What a thug. Chief Rabbi Amar – Has A Deal Been Made? What Was Shimon Peres Doing With Meir Amar? Ynet is reporting that Meir Amar, the estranged son of Sefardic Chief Rabbi Shlomo Amar who is reported to be underworld-connected and has no permanent address, visited his mother two days after the kidnapping and torture of his sister's boyfriend. Both Meir Amar and his mother have been indicted. Despite her claim to investigators to have only had passing contact with Meir, her son visited her a second time just two days later together with Labor Party leader Shimon Peres. While a police report had been filed and police were investigating the crimes, no newspaper or television reports of the crimes had yet surfaced. In other words, the leader of the Labor party appears to have known about the police investigation before it was public knowledge. What was Shimon Peres doing at the Amar household in the company of Meir "no-permanent-address" Amar? Ladies and gentlemen, the fix seems to be in. No wonder Rabbi Amar escaped indictment. The wife and son of Israel's Sefardic Chief Rabbi Shlomo Amar have been indicted for kidnapping and beating the boyfriend of Rabbi Amar's 18-year-old daughter. "My wife and I raised our children according to the belief that violence is wrong in all shapes and forms," the chief rabbi said. "I am saddened that my son Meir got into this situation I love him and pray to God that he will return to our family. I am also deeply saddened by the decision to press charges against my wife and am certain with my heart and soul that she was totally unaware of Meir intentions. I am also certain that in the end she will be found innocent." [Meir] Amar, his friends from Kalansua and another friend of theirs, Ayala and the boy then drove to the chief rabbi's house in Jerusalem. Amar spoke to his father [the Chief Rabbi] and mother while the boy, his "guards" and their friend sat in the living room. Mazal Amar-Sabag then went to the kitchen to make coffee for her son and his friends. From there she could see the boy in the living room with his captors. At 7:30 a.m., Meir Amar ordered the boy to leave the home, told him not to return to Jerusalem until 2007, not to carry a cellular phone, and not to have anything to do with girls for two years. He also told the boy that if he went to the police, they would kill him. Shas Chairman Eli Yishai said he knew all along that the chief rabbi would not be charged in the affair. "The day is not far away when the rabanit will be cleared of the charges against her," Yishai said. Does anyone really believe that if Rabbi Amar was a bricklayer or makolet owner instead of a Chief Rabbi with major political connections he would not be indicted? The Forward has a good overview of the charges and allegations surrounding both of Israel's Chief Rabbis. Metzger's victory was reported at the time to have been fueled by strong support from the leading figure in the ultra-Orthodox rabbinate, Rabbi Yosef Shalom Elyashiv, who is considered by many Orthodox Jews around the world to be the final authority in rabbinic law. Elyashiv's followers said they were backing Metzger despite his weaknesses because of his promised loyalty to Elyashiv on rabbinic law matters. Critics, however, grumbled that the ultra-Orthodox sage pushed the weaker candidate in order to discredit the institution of the state rabbinate. "Elyashiv supported the travesty that is Metzger because he wanted to thwart Ariel, but also because he wanted to embarrass the chief rabbinical post into oblivion," said Shahar Ilan, religious-affairs reporter of the daily Ha'aretz. Judaism's Black Pope strikes again. Tzemach Atlas has been banned from receiving aliyot (and presumably from other communal functions) by his synagogue. Why? He publicly criticized Chabad.